Fairways Apartment (4 star graded) is the whole top storey of the building. We offer complete privacy, 24 hour security, tranquility, hospitality and much, much more. Whether you are planning to visit the world renowned Garden Route or you are planning to play golf, look no further. The apartment can accommodate 4 guests in the 2 en-suite double bedrooms with a living room and a spacious balcony. Both bedrooms and the living room walk out onto the balcony. Guests can truly relax in this tranquil environment and will enjoy watching the ever present wild life roaming on the estate - many bird species, guinea fowls and small game (springbuck). Children are welcome. This luxury apartment (4 star graded by The Tourism Grading Council of South Africa) is situated on the upmarket Mossel Bay Golf Estate and Nature Reserve with 24 hours security. The estate is located in the central residential area of the town. All the major attractions, beaches, shopping areas and the N2 highway are within easy reach. "Absoluut pragtig! 'n Juweel op die gholfbaan!" 'n Pragtige woonstel, dit was 5-ster-verblyf! "Wonderful stay with wonderful hosts"
A home from home made to feel welcome from arrival to departure by our wonderful hosts. Beautiful apartment in a safe and special environment. Highly recommended. "This venue is highly recommended!" An absolute home-away-from-home experience! The host, Almerie, was really accommodating and she even provided us with a map to get around the with, as we were not too familiar with the area. Not to mention the stunning apartment and beautiful view! "Lovely situation with great views over the golf course"
A very comfortable and well-equipped apartment. Very safe location with the owners happy to help in any way to make your stay as enjoyable as possible. Nothing is too much trouble. "The best rental we have ever had... in any country"
Fairways was the best rental that we have ever had... several reasons: 1. The apartment was super clean..... attention to detail was amazing 2. Communications with the owner was very timely and easy 3. The owners were very hospitable and helpful regarding restaurants, attractions, directions, etc. 4. Location on the golf course was perfect 5. We would recommend this apartment to anyone ... 6. The key was the friendliness of the owners. Hierdie is iets uit die boonste rakke! Ek het nog nooit sulke verblyf beleef nie. Skoon, netjies, mooiste uitsig, en alles wat jy benodig is daar! Hoogste kwaliteit! "We had a brilliant stay at Fairways"
Mrs. Almerie was very hospitable and helpful regarding restaurants, attractions, directions, and provided a map or the area. The view was good but it was our bad night of fog. Would definitely stay at Fairways again. "Would love to go there again! Miss it already!" This apartment was our best stay in South Africa. Lovely, beautiful, comfortable, spacious... everything that we wanted and more. The best part though was Mrs. Almerie and Koos. "Luxurious accommodations at a reasonable cost"
The apartment was everything described and more. The apartment was spacious, luxuriously appointed, clean and bright. This is a five star accommodation in my opinion. What a serene and beautiful setting with a view that is unforgettable. Dit was 'n ongelooflike ervaring, pragtig netjies en skoon, wonderlikke gasvrye eienaars, kan dit beslis aanbeveel. Baie dankie Almerie, julle was wonderlik, hoop om volgende jaar weer so te maak! "The coziest place we stayed during our Garden Route trip!" We wowed when we arrived and Almerie took us upstairs. The king size bed and the bathroom are quite exclusive. This is definitely more than five star accommodation! The apartment caters for all your needs and more. It is modern, expensively decorated, clean and all the little things one would not imagine to find there is in place. The apartment is very private and you have easy and safe access. 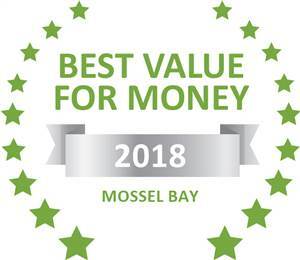 Based on reviews of establishments, Fairways has been voted Best Value for Money in Mossel Bay for 2018. 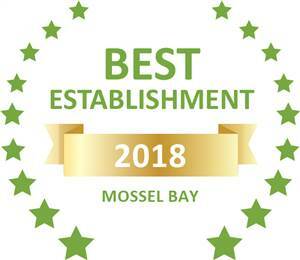 Based on reviews of establishments, Fairways has been voted Best Establishment in Mossel Bay for 2018. Visit numerous game lodges for game drives. Walk along the historical route in town to visit the many museums and the famous Post Office Tree comlex where the navigators, centuries ago, left post under this giant tree. Visit many diverse art and craft shops, enjoy outdoor activities like scuba diving, shark cage viewing, bungi jumping, trips to Seal Island, helicopter flips etc. Mossel Bay has the second most moderate climate in the world and has lovely white sandy beaches. Even during the winter most days are sunny with moderate temperatures. The town offers many tourist attractions. Drive along the whale route during winter months to watch the giant mammals of the sea. More than 2 guests: R180 per person extra. PEAK SEASON (16 Dec '19 - 5 Jan '20): The Apartment is let as a unit @ R1475 (maximum 4 guests). Minimum stay of 7 nights. Dates marked in green are still available. © 2019 Fairways Self Catering Accommodation in Mossel Bay. All Rights Reserved.